module-native-protocol-tcp will use 4317/tcp port to handle connections, need to open port. Unfortunately, firewalld currently doesn’t xml with service defined to just use --add-service=pulseaudio, but I already sent PATCH. Since 6.0 PA socket-activated so we need to write systemd unit. Also running PA from root is not good, so we will use systemd user-session. Now we need to create user and add it to audio group. All is ready. Login as media user and start and enable pulseaudio.service, but don’t try this. It will not work due to SELinux policy issues. We also need to enable lingering for this user to start systemd user-session in boot time, not when user logins. 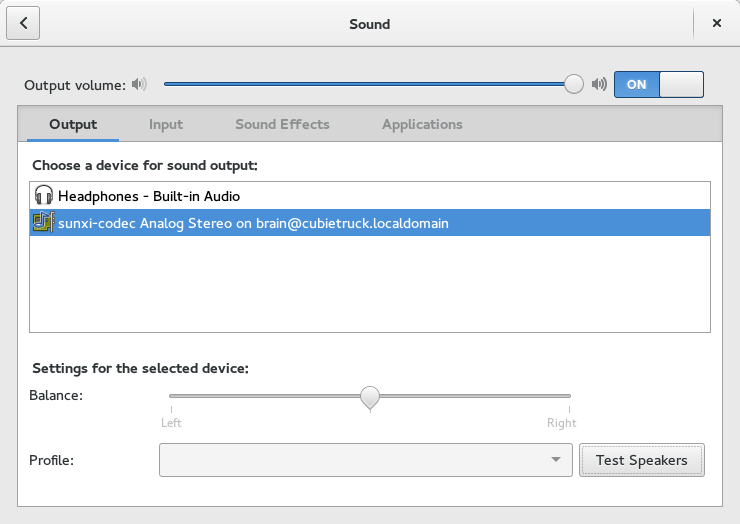 Restart pulseaudio and gnome-control-center, pavucontrol will find our server. $ pactl load-module module-tunnel-sink "server=192.168.254.20 sink=alsa_output.platform-1c22c00.codec.analog-stereo sink_name=cubietruck"
Is it working well for you? Last time I tried it, it was quite choppy. There were interruptions every few minutes. It needs good bandwidth (IIRC I read on official site 1.4Mbps). But anyway it works well. I’m listening music, watching videos and it works pretty well. I just checked — it takes ~ 192 kbps of my internet channel.